The boardroom can be an intimidating place. Whether you’re giving a presentation to clients or sitting across the table from highly influential people, your attire needs to be on point. Before you enter the boardroom, it’s important to stock up on some wardrobe essentials so that you project the right message. Ready to emanate authority while looking like a style icon? Here are nine tips to help you build a wardrobe that will impress even your toughest critics. The boardroom may not the place to try out new trends and styles. Put down the funky dress tie and floral print blazer so that you don’t accidentally distract your audience from your presentation. Sure, you might impress your younger coworkers in the office, but you might be met with disapproval in a boardroom filled with important people. Instead of trendy pieces, opt for timeless classics instead. A white button-down dress shirt, a navy suit and brown brogues are always in vogue and are a worthy investment for any professional wardrobe. It’s not just women who are guilty of choosing fashion over comfort. Men can fall victim to this mentality as well, and it is best avoided when you are making a presentation. Though you may look great, your audience will be able to tell if you are uncomfortable. 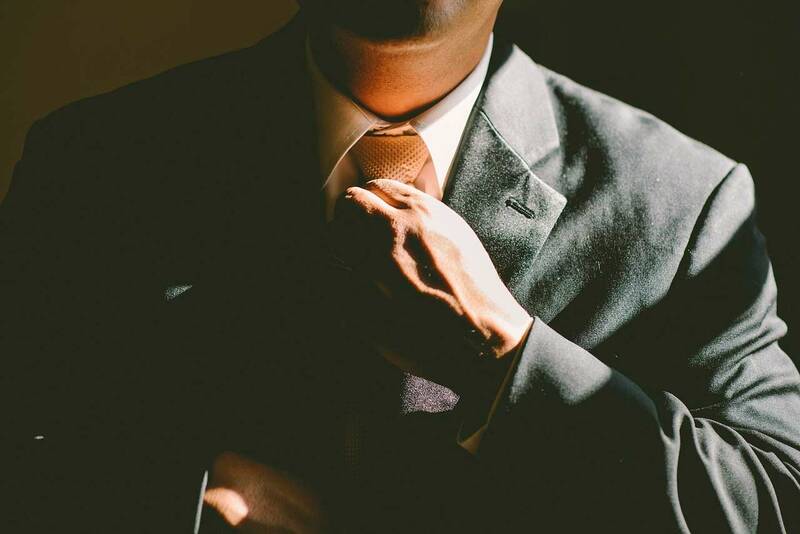 Finding both comfortable and commanding pieces can be difficult for some men, but it is should be a priority for anyone who wants to move up the ladder. By looking and feeling your best, you will be able to lead the conversation, while cutting a dashing figure. Being confident doesn’t come natural to all of us. For some lucky men, a powerful and stylish outfit is all it takes to suddenly become self-assured. For others, an outfit simply isn’t enough to transform into a powerhouse in the boardroom. 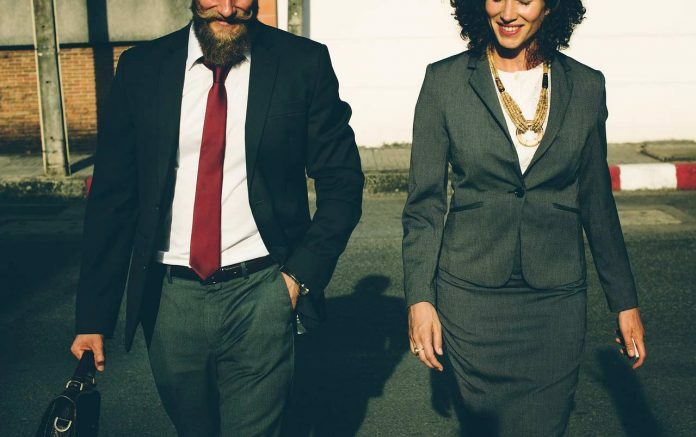 Even with a polished and well-tailored suit, you aren’t going to impress your boss or coworkers if you can’t project confidence. Learn how to be fearless in the boardroom and deliver your message with command. One of the quickest ways to lose credibility in front of influential people is by wearing an ill-fitting suit. It’s going to be difficult for boardroom members to focus on your material when they are distracted by droopy sleeves or baggy trousers. Schedule a visit to a professional tailor so that they can make some customizations and streamline your look. With a few adjustments, you will not only look professional, but feel more comfortable. Make no mistake—this will grab the attention of the board. Depending on the attitude of the workplace, your options for wardrobe personalization may be limited. However, this is precisely why you need to invest in the smaller details. After you have tailored your clothes, the next step is to focus on the right flourishes that finish the outfit. Cuff links, tie bars, lapels, watches and other men’s accessories are what set a stylish man apart from the rest of the herd. Get an accessories box subscription, and you will receive all the right accessories each month to help you build your business wardrobe. You can wear a dark grey suit and white button-down shirt all year long. Or, you could look far more stylish and well-dressed by paying attention to seasonal business attire. During the fall and winter, dark blues and greys will fit right in for boardroom meetings. Buy a few cashmere sweaters in darker hues to keep warm and lean towards suits with heavier fabrics. Lighter colors can be worn in the spring and summer, but be careful about your attire. Dress code policies vary, and you may accidentally break the rules if your outfit is too casual. Always look polished and professional, even if you choose summery suits in lighter colors and fabrics. How you dress and speak has a significant impact on how others perceive you. When you’re speaking to a specific demographic, you might want to keep your audience in mind before you decide what to wear. For instance, pinstripe suits are often worn by those in the financial sector and can make a better impression than a simple grey suit. When addressing a room full of 50 or 60-year-olds, you may want to forego mixing patterns and stick with non-distracting colors and patterns instead. Think that your audience won’t be looking down at your shoes? Some men mistakenly believe that their shoes will be hidden behind a desk or conference table, but they are wrong! Even if they are only on display during the beginning and end of the meeting, your shoes need to be on point. Do yourself a huge favor and invest in a nice pair of dress shoes. A pair of Oxfords or loafers are a classic choice that will never go out of style. Every modern gentleman needs a suit that he can count on in a pinch. The trusty warm blue suit is your go-to business attire that will never let you down, regardless of the occasion. Whether it’s summer or winter, formal or casual-business attire, the warm blue suit will effortlessly work for any occasion. Just steer clear of a light of blue suit, otherwise you can appear too casual and summery for the meeting at hand! When it comes to meeting important people in the boardroom, first impressions matter. Don’t let influential people make the wrong conclusions about you before you even start speaking! With some stylish essentials, you can instantly elevate your status and feel more at ease in the boardroom.